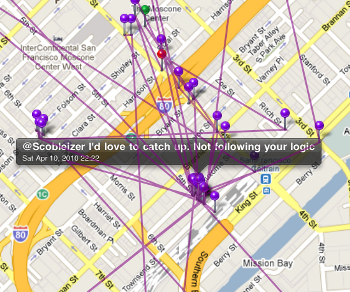 TrackU, an app for the iPhone, iPod Touch and iPad, shows just how easy it is to track any Twitter user if they geotag their tweets. 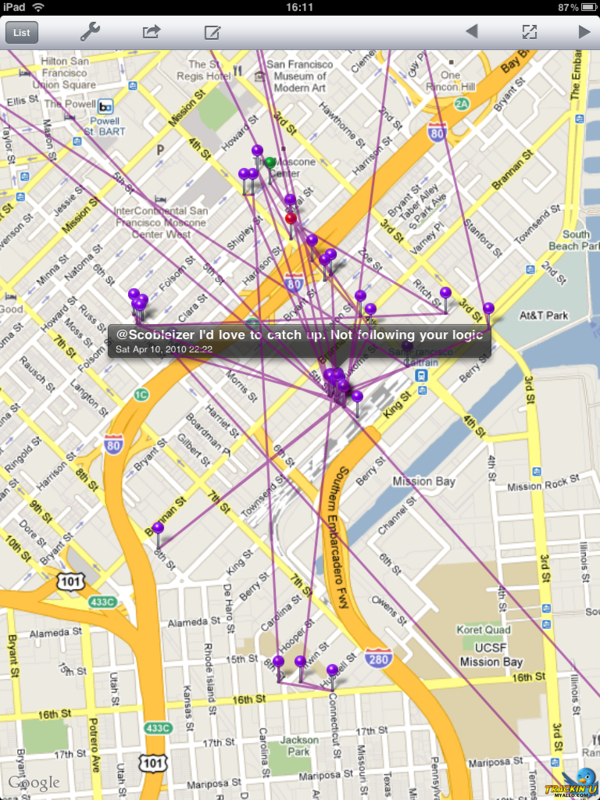 Basically, all you need to do is search for a Twitter user, and if they have geotagged their tweets, TrackU shows not only where those tweets occurred, but also the tweet text and most interestingly – lines connection all the dots. It certainly can be used for that purpose as long as you can convince your friends/family to geotag their tweets. A couple reviewers of the app in the App Store (the few reviews are generally positive) said that they had no problem convincing their friends and loved ones to turn on geotagging. Doubtful, however, that this would work with most people. Beyond casually stalking your friends and family with their permission, however, the app is wide open for you to punch in any user on Twitter and – and this is a big and – if they have geotagged their tweets you get the Google Map showing where they’ve been. 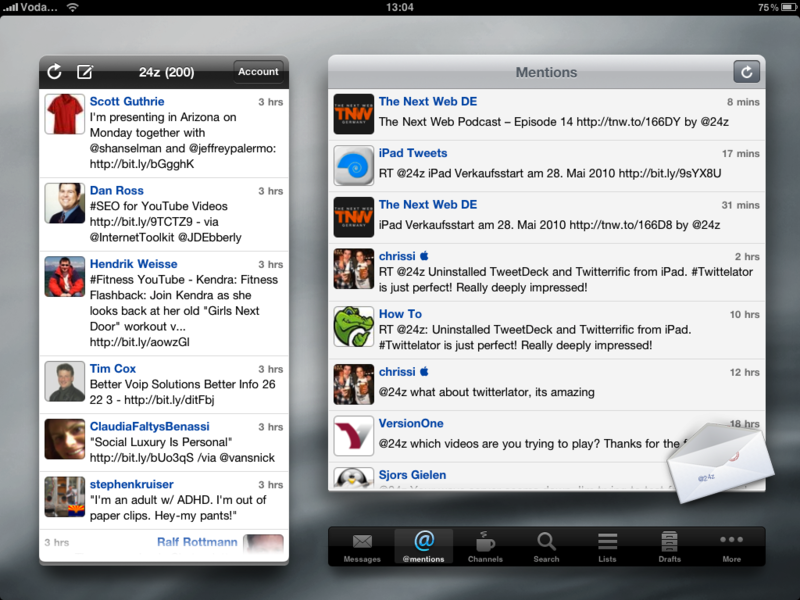 (We’re not sure why, but for some reason the API call seems to stop at 200 recent tweets). Also, it seems that not all geotagged tweets that should be, are showing up are (for example, enter @chadcat – all tweets are geotagged but the app shows sparse data). However, this is probably either a problem with the API or a bug that will be fixed soon. We noticed a couple of other bugs, but bugs are a part of app life, and nothing else was that glaring. To be perfectly fair, the app (at least on the iPad) looks great and being able to add not only multiple people to track but also multiple “tracks” of one user, is – for what the app sets out to do – some nice features. Of course, lots of people won’t care about that at all. What they’ll care about, is that this is no random aggregator of location data – this is a dedicated tracking app that leaves anonymity nowhere to be seen (or mapped). On the other hand, in it’s current state, this app probably won’t have much effect beyond a few geo-power users, because geotagged tweets represent under 1% of total tweets. However, if either geotagged tweets and/or the app developers integrate other services such as Foursquare, Brightkite or who knows, even Facebook check-ins, this very precise app could become an interesting one to watch. While there are other mashups that show anonymous aggregated check-in data such as Checkinmania, FourWhere and Vicarious.ly, this app as we’ve said, isn’t about aggregation – it’s plainly and directly about tracking individual users. We won’t pontificate more than necessary – location sharing is what location sharing is. Read next: The iWatch. I'd buy this in seconds. So would you.